RAVENNA, Ky. — In less than a year, CSX Transportation has transformed a 50-year-old Chesapeake and Ohio Railway caboose from dilapidated to dazzling. 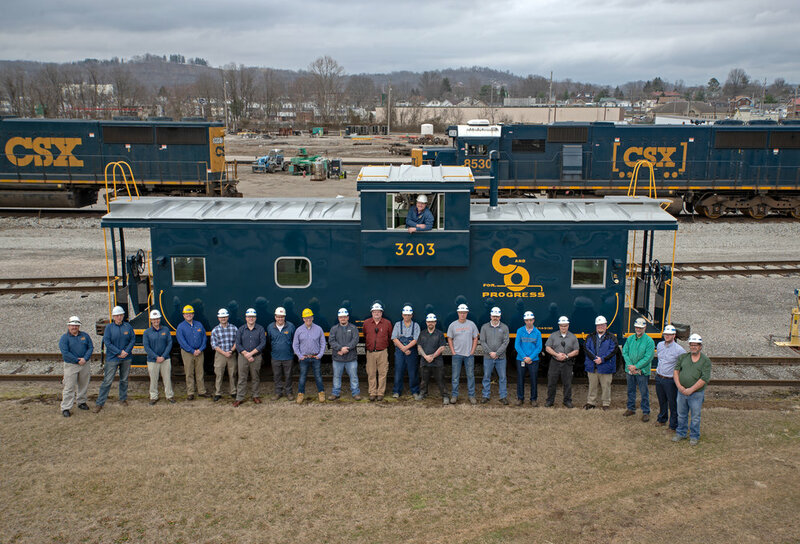 On Tuesday, February 5, 2019, CSX Transportation formally unveiled the completely restored 1969-built showpiece, captivating members of the Kentucky Steam Heritage Corp. (KSHC), the caboose’s new owners. CSX donated caboose no. 3203 to the Kentucky-based non-profit last May, and promised the group that the car would be delivered after some cosmetic restoration and, possibly, a fresh coat of paint. The planned improvements, however, turned into a complete overhaul; a labor of love that now is a sparkling testament to the talents and dedication of the workers at CSX’s Huntington shops. The caboose was built by the International Car Company in Kenton, Ohio in March of 1969 and immediately went to work for the C&O, a predecessor railroad to CSX. In original service, cabooses housed a crew of three: A conductor, a switchman and a brakeman. The caboose served as crew quarters, offices and acted as a place for crews to keep an eye on the train and its vital functions, especially air pressure for brake systems. In the 1980s, cabooses were no longer federally-mandated and were phased out as electronic monitoring systems were implemented across the industry. Many were donated to museums and cities, but the majority were scrapped. The units that survived into the 2000s were generally used as places for crews to occupy during short shoving and switching moves. When built in 1969, C&O 3203 was one of the first in a series of cabooses to be painted in a striking blue and yellow color scheme, which lasted until it was re-lettered for the Chessie System in 1979. The faded “Chessie System” paint was still visible as the caboose ended its career on CSX — many of its windows welded over with steel plate — in Cordele, Georgia, in 2018. The restored version is intended to faithfully recreate how it looked when it was first delivered. In May of 2018, at the unveiling of KSHC’s “Kentucky Rail Heritage Center,” a planned redevelopment of the former CSX railyard in the small Estill County community of Ravenna, Kentucky, Shantel Davis, CSX Asstistant Vice President of Corporate Real Estate, surprised KSHC and the community, in announcing the caboose donation. The Kentucky Rail Heritage Center will be an economic development endeavor, utilizing the region’s rich rail history as a springboard for rail-based tourism and vocational training. The project aligns with Shaping Our Appalachian Region’s Regional Blueprint goal of making Appalachia Kentucky a tourism destination. The Kentucky Steam Heritage Corporation intends to put the caboose on display at the Rail Heritage Center for visitors to learn first-hand about caboose train operations. It will occasionally transport people who want to go on short “caboose hops” to experience what it was like for train crews in the golden age of railroading. The Kentucky Steam Heritage Corporation was formed in 2015, with the intent to restore and operate another vintage C&O piece, steam locomotive no. 2716, which is currently on long-term lease from the Kentucky Railway Museum. The restoration and operation of 2716 and other historic pieces are planned to help bring the region’s rail history alive, and will serve as an educational tool, enhancing heritage tourism and stimulating economic growth. For more, visit www.kentuckysteam.org or on Facebook.